I’ve been fascinated with dinnerware ever since I was 5 years old. 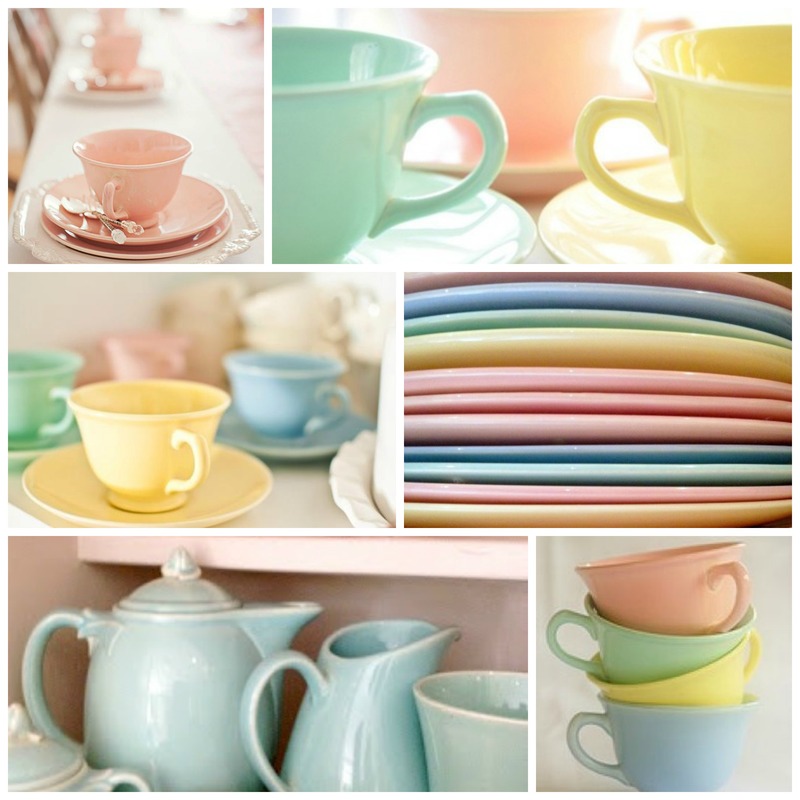 My mother had a set of Lu-Ray Pastel Dinnerware displayed in the hutch, in the dinning room. Back then, I didn’t know what they were called, I just knew that I was fascinated by them. I’d go in the dinning room (which was only used for special occasions), and stare at them. I’m not really sure what it was that fascinated me so much? Maybe it was because each one was a different color, or maybe it was the colors themselves? I wonder how many other little girls were fascinated by dinnerware? Probably not too many. Who knew…that one day I would be making dinnerware. I certainly didn’t. One of these days, I’ll make my own version of pastel dinnerware. I just have to find the perfect glazes first. I’m not sure if I should just make them for myself, or also put them into production? What do you think? Would you buy pastel dinnerware? This entry was posted in Uncategorized and tagged art studio, artist, artist workshop, blogging, Blogging from A to Z April Challenge 2015, ceramics, clay, color, D is for Dinnerware, designer, Dinnerware, Dinnerware Sets, Etsy, facebook, glaze testing, glazes, handmade, handmade dinnerware, handmade plates, home decor, Melinda Marie Alexander, Pastel Dinnerware, pinterest, plates, potter, pottery, Raven Hill Pottery, ravenhillpottery.etsy.com, stoneware plates, tabletop, twitter, wordpress, workshop by ravenhillpottery. Bookmark the permalink. I have some pastel dinnerware that I bought years before. It’s time to replace them, because they are dwindling. I love pastel dinnerware for everyday eating. It brightens the table! Alas, I would not buy pastel dinner ware (snicker). I do love the look of it though. We are more of a Frankoma family. The first time I had dinner at my husband’s (then new boyfriend) bachelor pad he served my Tai take-out on mixed matches dinnerware in a variety of shapes and earthy colors. I had no idea at that time it was collectable vintage dinnerware nor did I have a clue I was about to marry a man with a (dum dum dum) pottery addiction! 15 years later we 2 bright and talented children and cabinet upon cabinet of Frankoma pottery. I am. You can find them at the 10 minute novelist group thread or I am at scarlet embers dot wordpress dot com . I’m not sure how I feel about pastel dinnerware- but I could probably be persuaded 😉 From the pictures that you have above I think I certainly would like to own a set! I loved your little post- it reminded me of my Grandma’s dinnerware- even as a small child I was obsessed with the design. It turned out my grandmother noticed because she left her entire blue willow set to me. Which was so amazing!! Anyway- just wanted to share lol. Oh yes, I would buy blue or turquoise and have to buy a pink set for my daughter Annie! I inherited a beautiful set of pink and green china from my mother. The pink would be great for extra pieces! How about a lavender? My other daughter Ali loves that, as do I.